21 April 2019 | Chetwynd Deer Park, Newport, Shropshire, TF10 8EU | Visit www.classicmotorshows.co.uk/chetwynddeerpark for more details. ​We are pleased to advise that our Easter Motorfest has a new home at Chetwynd Deer Park. 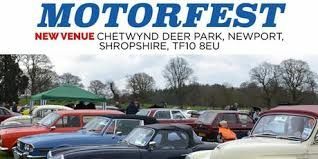 Just 10 miles from Weston Park, Chetwynd Deer Park, the home of the renown Newport Show, will host the 2019 Motorfest. ​With an interactive arena timetable throughout the day featuring arena parades, ‘Pride of Ownership’ awards plus our famous ‘Decibel Duel’ where we look to find the loudest vehicle at Chetwynd Deer Park.